But for the last two years and counting, I download this list of expiring domains daily as I strategize about which domains I’m going to actively bid and at what cost — via GoDaddy’s Watching download (see image below). 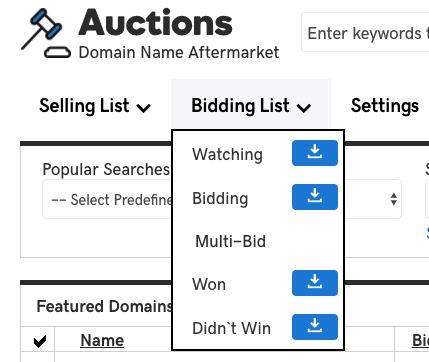 I also use it as a tool to test my ability to guess what a domain auction is likely to close at, adding an extra column next to the bid Price column with my own estimated auction close value. 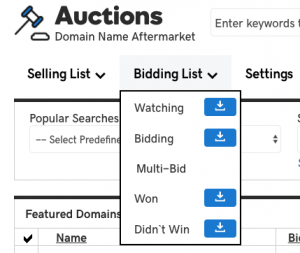 I then check the auction close prices from the previous and compare the value with the value I assigned to each of the domains I tested against. But I digress. There are thousands of expiring and closeout domains contained in the daily Watching exported CSV file. Some of the domains have bids while a good percentage have 0 (zero) bids at the time of export. Nevertheless, I move each daily exported Watching CSV files to a storage drive at the end of every week. It was this action of “digital” spring cleaning that uncovered over 2 years worth of exported daily expired domain data. In my very first export file, now just over 2 years old, I discovered nearly 10 percent of the domains were available at hand-reg fee. I executed a few additional bulk searches from different months and found most to have 6-10% of the domains available for hand registration. And although I was tempted to bulk registration a few of the files, I slowly and calmly backed away from the browser to institute a 24-hour “sleep on it before purchasing” policy. Nevertheless, if you’re wanting to give this feature a try, do note you must start exporting the Watching list daily or weekly, but not attempt to bulk search until about 40-60 days into the future from export date. It’s also worth noting I chose to use Hexonet’s Bulk Search feature over GoDaddy because of it allowing 1,000 domain searches as opposed to GoDaddy’s bulk limit of 500 domains per search. And last but not least, for those of you with a bit of software development and engineering prowess, you could simply automate this process from A to Z using scripting, a database, and GoDaddy’s API to check domain availability. Godaddy is not issuing anymore API accounts, they have enough bots gaming the system. Hi Travis – Yes, GoDaddy is not issuing accounts for *Auctions API*. The API I referenced in the article pertaining to checking domain availability DOES allow for new Developer accounts (two different API’s). As for accessing Auctions API today, one had to have had access to the Auctions API prior to July 2016, per an email from my GoDaddy Account Manager. I don’t use Godaddy much, but i’m going thru drop lists and other auctions daily, for years, and once in a few months i always check all my archive lists for availability. Can’t count how many great domains i grabbed this way.